Stickman is dominating internet online games, especially sport games, where he is shooting, dunking and throwing ball around. In soccer he is especially good and he will bring you many hours of football fun. Stickman Soccer Online is a clone of mobile phone game and will give you as much pleasure as mobile version but now you can play it on big TV or high resolution monitor. When you brake your mouse playing this game, you can also try Stickman Soccer 2 and browse new teams, new stadiums and even new mods. Stickman soccer is a most popular sport game of 2014. Enjoy playing this awesome soccer game with cleverly designed controls and beautiful animations that will amaze your senses. You can compete with a national team from your choice and try to win a championship by beating a opponents. 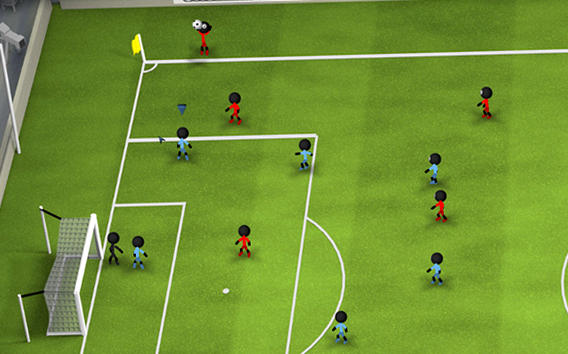 There are thirty two different teams and various stadiums where you can display your stickman soccer skills. You can play this game on your Android or iPhone, and now you can play Stickman Soccer online. Join milion other player that already enjoyed this awesome game all around the world. If you by any chance get bored, you can enter Bonus Street Soccer mode where you have even more fun. You can even see if you can beat your friends score with integrated ranking system. If you choose to play in single player, you will have three modes available, from easy to medium and hard. You can enjoy easy controls and even modify them so you will run automatically. Stickman soccer will bring you a pumping action of world cup in Brazil onto your computer. You can play it online without needing to install it to your computer or smartphone. And if you get bored playing with it, you can try many other games at our website.